Tomatoes (59%), water, modified maize starch, WHEAT flour, sugar, rapeseed oil, BUTTER, whole MILK powder, salt, yeast extract, vegetable juice concentrate (CELERY, carrots, leek, onions), spices (onion powder, garlic powder, white pepper), stabilisers (sodium triphosphates, sodium polyphosphate), herbs (bay leaves powder, thyme). MICROWAVE: Individual microwaves may vary. Refer to manufacturers' instructions. Do not microwave a closed pouch. Cut corner of pouch as indicated by dotted line. Place pouch in microwave. Select power 600W-900W (or 1000W-2000W 50% power). Heat for 2½-3 minutes. Pour contents into serving bowl, stir and serve immediately. WARNING: pouch and content will be hot. ON THE HOB: Open the pouch. Pour contents into the pan, heat product to a minimum temperature of 75°C. Stir from time to time. COMBI-STEAMER OVEN: Preheat the combi-steamer oven to 95°C, 100% steam. Place the unopened pouch in a perforated tray suitable for use in the combi-oven. Heat for 30 minutes at max 95°C, 100% steam. Remove immediately from combi-steamer oven, open & transfer contents to serving unit. Ensure that the temperature of the contents is >75°C. WATER BATH: Place the unopened pouch in a water bath (85°C). Heat through for 30 minutes. Remove from water bath, open & transfer product to serving unit. Ensure that the temperature of the contents is >75°C. HOLDING PRODUCT IN A BAIN MARIE: Product should be held at or above 70°C for a maximum of 4 hours & stirred frequently to ensure even heat distribution. Prepare only the amount needed for one service period & do not add fresh product to older batches. If products remain unopened after heating, it can be cooled down to <10°C (following HACCP rules) and reheated to above 75°C for use within 24 hours. - Store in a cool dry place. Once opened, refrigerate and use within 48 hrs. 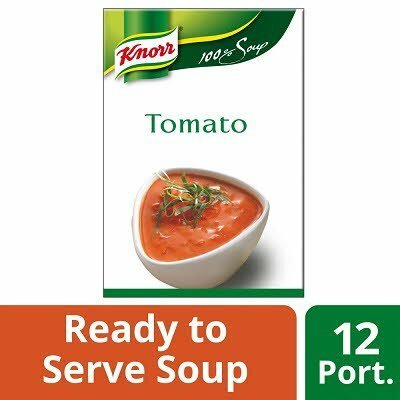 For point of sale kits to advertise your soup offer or serving kettles (free on loan with a minimum quantity order), please see the promotions and sales support section of the unileverfoodsolutions web-site or call 0800 783 3728 (lines open Mon-Fri 9am-5pm. Calls may be recorded).